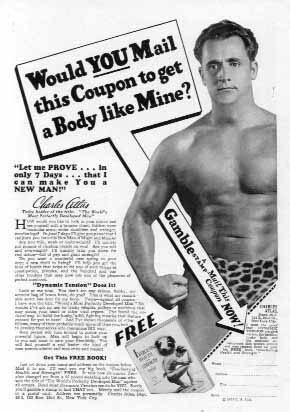 Craig Knight points us to Welcome To Charles Atlas Ltd..
Atlas (not his real name, I'm guessing) was in the right place at the right time with the right message. Before he came along almost a hundred years ago, the idea of bodybuilding was largely unknown. You spent your life trying to get lucky enough to avoid physical labor and exercise, after all. The success of efforts like his makes many of us believe it's easy to change the way the world thinks about an industry. It's not.